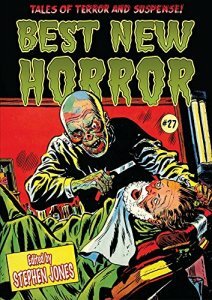 Steve Jones’s Best New Horror #27 features a grisly cover image reproduced from Chamber of Chills, a short-lived comic from the early 1950s that was a casualty of Fredric Wertham’s Seduction of the Innocent and his notorious crusade against violent comic books. It’s a reminder of the days when horror was packaged pretty much the way everybody expected it to look – garish and bloodcurdling. Although Jones has chosen the image for nostalgic reasons, his selections for his anthology contrast notably with it. Some have their moments of physical horror, but all 17 stories show the artistry that horror’s best writers achieve in their work. The volume leads off with ‘‘The Coffin House’’, one of a handful of stories by the late Robert Aickman (who died in 1981) that eluded publication until 2015. Aickman’s best stories are masterpieces of oblique horror in which characters find themselves slipping into a world of strange and sometimes nightmarish experiences, and this tale – about two young women on a walk in the country who become trapped in a house with two elderly lunatics (or are they?) – is one of his signature excursions into the macabre. Jones has also selected two stories from a tribute anthology to Aickman’s fiction, Aickman’s Heirs: John Lan­gan’s ‘‘Underground Economy’’ and Daniel Mills’s ‘‘The Lake’’, the latter of which is punctuated by a haunting image as inexplicable and disturbing to its characters as it is to the reader. Tribute anthologies have become a staple of the horror field in recent years and Jones has tapped several others for their best selections, including Helen Marshall’s ‘‘Expo­sure’’, a tale of a stranger in an even stranger land from an anthology that pays homage to Robert W. Chambers’ landmark weird collection, The King in Yellow, and Richard Gavin’s ‘‘The Barnacle Daugh­ter’’, which finds a novel approach for a story set in the increasingly overworked terrain of Lovecraft’s ‘‘The Shadow Over Innsmouth’’. As with Aickman’s Heirs, Jones double dips from several other sources for his selections. Two stories from Terror Tales of the Ocean use the seaside as a backdrop for intensely personal dramas. In Lynda E. Rucker’s ‘‘The Seventh Wave’’, another of her excellent psychological portraits of an isolated character in a state of emotional crisis, the narrator describes the devastating seaside tragedy that took her family from her in terms that make it seem an externalization of her long-troubled state of mind. Similarly, in Conrad Williams’s ‘‘The Offing’’, the turbulence and horrifying alienness of the sea serves as a correlative to the dysfunctional behavior of the family it profiles. The 2nd Spectral Book of Horror Stories provides Jones with another two stories: Kurt Fawver’s ‘‘Marrowvale’’, in which a writer travels to a remote Pennsylvania town to investigate one of its bizarre Halloween traditions and discovers to his misfortune that it is rooted in something worse than mere eccentricity, and ‘‘The Larder’’, in which Nicholas Royle manages the ingenious feat of invest­ing a wildlife guide about birds and their predatory habits with ominous significance for the narrator and his relationship with his lover. Jones’s other selections show the wide variety of horror story being written today. Storm Constantine’s ‘‘In the Earth’’ is a bad-seed tale laced with super­natural portents. 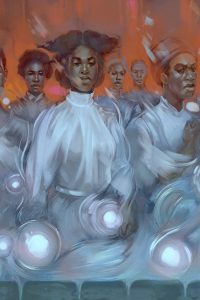 Gemma Files’s ‘‘Hairwork’’ (also picked up for Year’s Best Weird Fiction: Volume 3) is a haunting of account of a family legacy of black magic, handed down through a slave bloodline from the antebellum south to contemporary times. Ron Weighell’s ‘‘The Chapel of Infernal Devotion’’ is, like most of this author’s work, very much in the antiquarian ghost story tradition. Steve Rasnic Tem’s ‘‘In the Lovecraft Museum’’ is an extraordinary novella-length work which uses references to Love­craft and concepts in his fiction to illuminate its main character’s sense of detachment from his world and inability to connect in any meaningfully intimate way with others. No Cthulhu Mythos pastiche this: it’s a superb example of how one writer can appropriate ideas implicit in the work of another writer and use them to serve the needs of his own concerns and style. 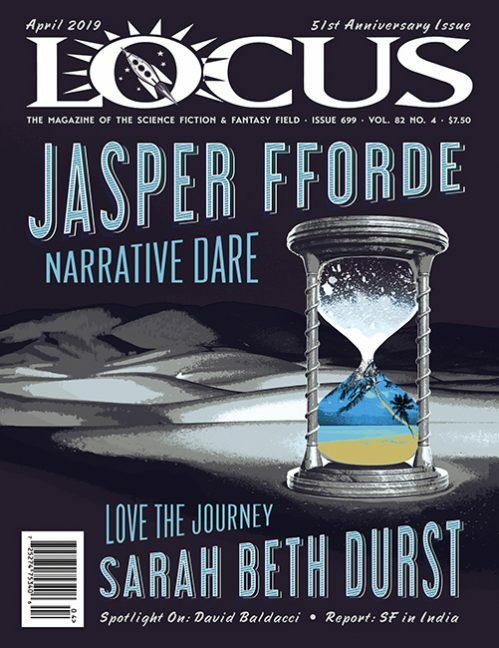 As in years past, Jones brackets the book’s fiction selections with a far-ranging introductory survey of horror in a wide variety of media for the year and a ‘‘Necrology’’ of deaths relevant to the horror field, compiled with Kim Newman. At nearly eighty pages, the ‘‘Necrology’’ bulks almost as large as Jones’s Introduction and is absolutely invaluable for showing the reach of the horror genre and how many people have contributed to it in its many forms over the past century.